Representatives of the Catie Carnes Foundation Inc. with Dr. Dina El-Metwally (left) and Dr. Cynthia Bearer. Since 2012, the Catie Carnes Foundation, Inc. has organized a 5K Run/Walk to celebrate the life of Catie Carnes, an avid horseback rider, while at the same time raising funds to support the needs of children diagnosed with Juvenile Diabetes. This year’s Giddy Up 5K took place on Sunday, August 10 at Padonia Park Club. Participants celebrated in cowgirl and cowboy themed attire, all for a great cause! 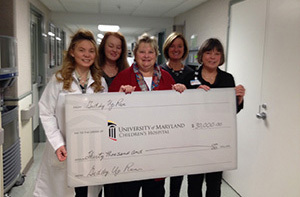 The UMMS Foundation is grateful to the Catie Carnes Foundation, Inc. and all of the participants for their ongoing support. Next year’s event date will be posted on our Calendar of Events.